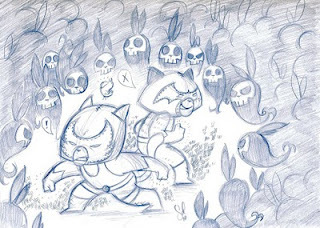 The Tanoshiboy Chronicles: Design & Illustration Blog: "We're outnumbered 100 to 1...done!" "We're outnumbered 100 to 1...done!" As you know, Sushi and Gazpacho were born last year and they have been some of my favorite new characters to draw. They're tag team luchador partners. So here they are again in battle mode, ready to take on 200 coneheeghosts. Coneheeghosts are touchy creatures. Mild-mannered one second and a horde of formerly-furry-fury the next. Enjoy!